Is alienation of the Greyton Commonage legal and is it necessary? This question is central to the proposal for a fruit farm in Greyton. It is absolutely clear that Herbert Vigne bequeathed the Commonage to the people of Greyton. Neither the Will, nor the intent, has ever been in dispute. According to the TWKM By-law, which was gazetted on 21 June 2015, municipal commonage means land owned by, or under control of, the municipality which has a zoning of “undetermined” and which may be set aside for grazing or for such other purposes or use as may be deemed necessary by the municipality. There is no reference whatsoever to the possible sale or alienation of commonage land. There is much confusion in this document, and therefore in the conclusions drawn and recommendation made, that makes one very suspicious of its validity. For example, there is no mention of any record of the removal of restrictions presumed to have been in the original Title Deeds for Greyton and the 2 farms mentioned, but ‘apparently’ missing from the deeds for the remainder of Erf 595. We consider that if there had been any intent to permit alienation of all or part of the commonage, contrary to Herbert Vigne’s Will, then some evidence would have been found. Therefore, we submit that the onus must be on TWKM to prove beyond all doubt, to the satisfaction of the community, that they can legally alienate any part of the Greyton commonage. PC.Doc.12/1997 Municipal Commonage: policy and procedure is relevant. Where a portion of the properties, formerly known as Municipal Commonages, is to be utilised for development, the municipality must, in consultation with the Dept of Land Affairs (DLA), satisfy themselves beforehand that such development will not result in the dispossession of people’s rights (formal or informal) granted on or over such commonage land. In the event that people’s rights are affected, it is a prerequisite that other arrangements satisfactory to those people have been made. Furthermore, the municipality may not alienate, dispose or sell the Remainder of such a Municipal Commonage property but must retain and utilise the said Remainder for public use, which is to ensure that such land is released to the needy local poor residents for agricultural purposes on a leasehold basis that fosterers and facilitates Rural Development. The DLA will also actively discourage the selling of commonage, except where this is clearly required for town development and urbanisation which enjoys the wide support of local residents. The reasons for distinguishing ‘Commonage’ land from other municipal land clearly relate to the actual or proposed use of the land – for needy local people. The primary uses of the Greyton Commonage have been the grazing of farm animals and recreational activities. Should this property be alienated then the existing rights of the local people would be removed. It is pointed out that alternative BBBEE projects for fruit farming could be considered for the same area of land, but on a leasehold basis. Any decision must take into account the dominant and widespread view of the community. The future amenity value of this area of land, if alienated, will be lost to the community and the municipality will have given away a financial asset of significant value, far exceeding the proposed ‘give away’ price. The proposed project should be reconsidered on the basis of the sustainable long term interests of the Ward 2 community and the municipality. Should you want to be placed on the Ward 2 Forum Information Database please complete the online form to the right of this post. 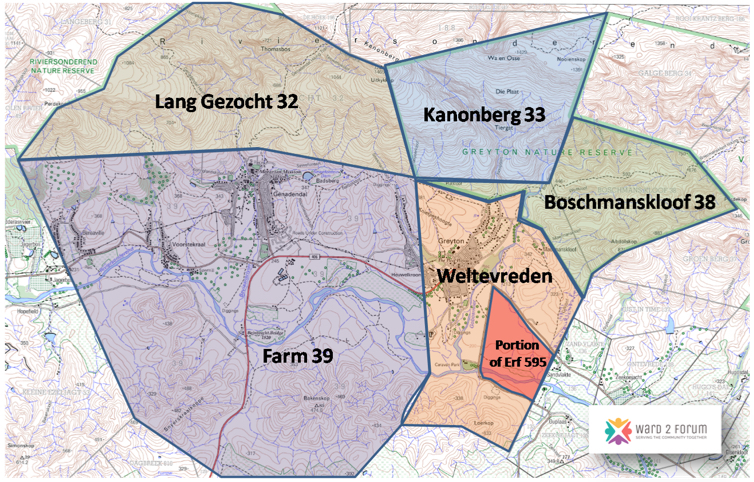 – the people living / owning property in the area making up TWK Municipality? – The Municipal administration, paid by the rates … to administer assets considered Municipal? in both instances it is not the Municipal employees whatever their rank. This statement from above – I whole-hearted support the view that this land cannot/should not be sold off. Will TWKM try to prove the above as per this statement or are we, as a community, going to have to take legal action to force them to prove it one way or the other.